Online sales are expected to show a 15 percent increase this holiday season, and as consumers do more of their shopping online, retailers and other businesses are trying to figure out ways to make money from all the traffic that comes to their websites -- even if they don't get a sale. For some retailers, airlines, and even non-profit organizations, that means opening up their websites to advertisers. Browse Target's website for a TV, for example, and you may see an ad for cable TV service or a new video game. Or there might be an ad that takes you to the Sony website. Target spokesman Lee Henderson said the connection between search and ads is all by design. "The ads displayed are directly relevant to the guests' search engines and search entries, giving them a more customized experience," he said. The retail giant gets a "modest" amount of revenue from the ads appearing on its website, which consistently attracts more than 25 million unique visitors a month, Henderson said. But he wouldn't say how much revenue those ads generate. The ads on Target's website are provided by Google. Sometimes they include pitches from competing retailers such as Sears and Sam's Club. But Henderson said Target doesn't mind providing ad space to rivals. Potential customers often comparison shop and Target doesn't mind making money helping them do that. "Research shows that consumers typically visit four to five sites before ultimately finding the item that they want to purchase," he said. "And by providing this information as part of the Target experience, we believe it will help our guests make a Target purchase." 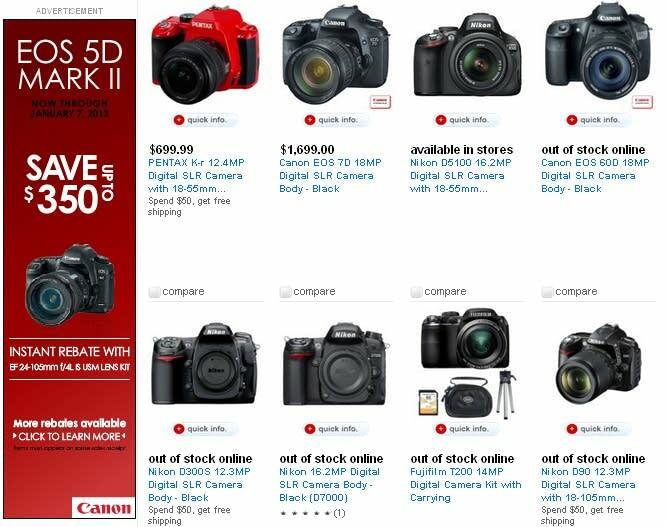 Target isn't alone; Best Buy also hosts ads provided by Google based on the same strategy. The St. Paul Chamber of Commerce also has found advertisers believe its website is a good channel to reach potential customers. A prominently displayed ad on the chamber's website costs $4,000 a year, and the chamber's website includes pitches from local colleges, consultants, and translation and cleaning services. "We really want to be on the cutting edge of innovation with our advertising," said Kelsey Siqveland, the chamber's manager of marketing and communications. "It is very beneficial for the chamber and for our members." The Minnesota Council of Nonprofits also said some of its members are looking at website advertising as a more consistent source of revenue in tough economic times when donations and state and foundation grants are harder to come by. The Minnesota Vikings website has been a consistent winner in the eyes of advertisers, even though the team is having one of its worst seasons ever: The site boasts ads for everything from banks to beer. "When you have millions of page views and unique visitors and video views over the course of a year, that definitely captures the advertisers' attention," said Steve LaCroix, the Vikings' chief marketing officer. Delta Air Lines, the dominant airline at Minneapolis St. Paul International Airport, is just beginning to explore ways to generate ad revenue from its website, said Tim Mapes, Delta's senior vice president of marketing. The airline's home page has been featuring an ad for a major hotel chain. At a recent conference with Wall Street analysts, he said he sees an enormous opportunity in making Delta's roughly 160 million customers a year, "one of the most highly sought after socioeconomic profiles out there," available to advertisers. Through its website and check-in kiosks, Delta also figures it has billions of page views per year that can be sold to advertisers. Delta's customers include "frequent business travelers, people who have Lexuses and BMWs and Mercedes," Mapes said. They represent "an enormously attractive demographic to advertisers and other premium marketers." Like Target and Best Buy, some of the ads on Delta's website come from Google, which feeds ads to some 2 million websites, from bloggers to the New York Times. The owners of those sites collect a total of about $6 billion a year from Google. Jay Habegger, CEO of Owner IQ, a firm that helps retailers make money from their websites, predicts a growing share of ad dollars will flow to retail sites. "I see it as being a somewhat under-the-radar trend for the next couple of years," he said. But in three to five years, the ad industry will wake up and say, "Oh my gosh, some significant percentage of the digital spend is now being spent in media outlets that nobody would have considered a media outlet today." That development, if it happens, could spell yet more challenges for news and media industries already rocked by the online world and its impact on their traditional ad revenue models. Retailers, which have long been a major source of ad revenue for news organizations, may evolve into the next major competitor for advertising dollars.